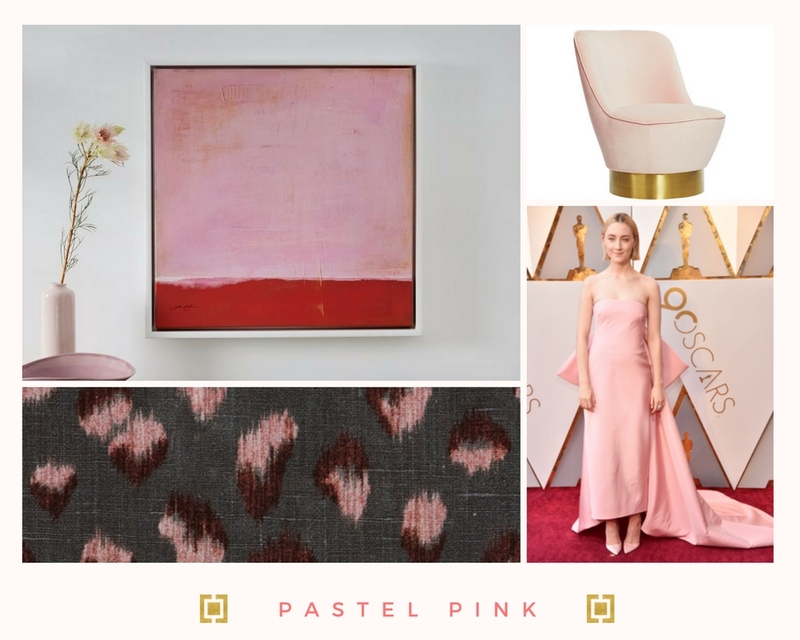 The votes are in and it looks like Saorise Ronan, pretty in Calvin Klein pastel pink, is being named one of the best dressed from last evening’s 90th Academy Awards. Though I have not seen Lady Bird, the film that sparked her nomination for best supporting actress, it most certainly has my attention now. Her dress also had me re-thinking a color that I don’t typically have on my radar, for design projects and otherwise. Pink has been for a long time dubbed as ultra feminine, however it seems pink is having a bit of a re-birth…. I love how elegant the hue can be, and even its edgy modern side as evidenced by the beautiful abstract and glam slipper chair. I’m rethinking, PINK! Saoirise Ronan in Calvin Klein by Appointment Dress, Oscars 2018. Via VOGUE online. Simone Blush Chair, CB2. See here. Framed Print, West Elm. See here. Kelly Wearstler Feline Fabric, See here.